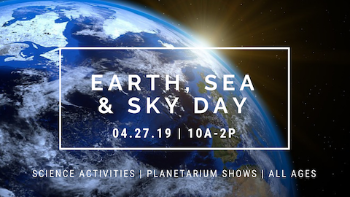 Lake, Porter and LaPorte County educators are invited to share a photograph and brief description that represents how their school and/or classroom does their part to take care of our home planet - Earth! 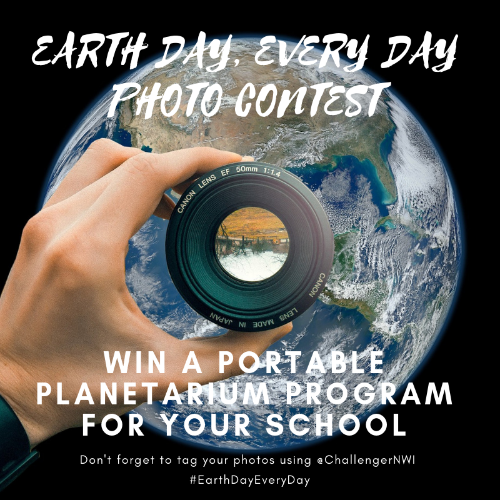 To enter, simply "like" or "follow" one of Challenger's social media pages, upload your photo, and tag us in the picture @ChallengerNWI, and use the hashtag #EarthDayEveryDay. All photo entries must be submitted by Sunday, April 21st at midnight. On Earth Day, April 22nd, we will announce the winner online for our Earth Day, Every Day Contest. 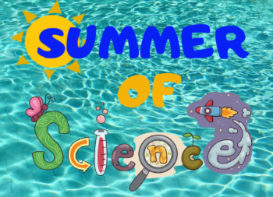 The winner of this contest will receive an out-of-this-world Portable Planetarium program for their school! Eligibility -The contest is open to all educators within Lake, Porter, and LaPorte Counties. Data Protection and Publicity - By participating in the contest, you consent to your name and school name being disclosed if you win the ticket giveaway. You also grant Challenger full ownership of your image for use in advertising and promotional material related to this contest. In addition, you give Challenger the right to publish the photo in promotional materials with the understanding that there will be no fees, remuneration or any other compensation transmitted to you for this right. You further hereby waive all rights of inspection and release the Challenger Learning Center from any and all liability arising out of such use of your name or photograph. You certify you hold all rights to the photographs listed. Photographs may include shots of people, items, artwork, nature, or anything that demonstrates environmental stewardship. Images that do not meet these requirements may or may not be included in the display or may be rejected from the contest. Judging - Judging will be conducted by Challenger Learning Center staff. By entering this contest, participants agree to abide by the contest rules and recognize that the decision of the judging committee is final. The quality of the photograph, relevance to the theme of the contest, and creativity/originality will all be examined in conjunction with artistic merit. For more information contact the Challenger office at (219) 989-3250 or at emma@clcnwi.com.